Our church is based on Baptistic principles which include Believers Baptism and open Communion. Church membership is open to all who believe in Jesus Christ and who seek to follow him. The church is congregational in government and has a Deaconate consisting of a Pastor and Deacons (both male and female) appointed by the members. Our church is a member of the Baptist Union of Scotland. Click here to go to the Baptist Union of Scotland website (opens in a new tab). 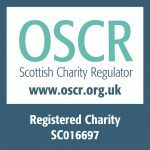 We are a registered charity. Click on the OSCR logo for more information (opens in a new tab).